A book reviewer’s ideal tome is short, easy to read and yet leaves them with lots to say. So thankyou Jonathan Ames for You Were Never Really Here, a slight book – perhaps novella is a better description – that is just 97 pages in length. What’s more, the type is rather large. It can be whipped through in one evening – which is exactly what I did. In fact, it proved to be the perfect company during a wind and snow-dogged night not so long ago. Some novellas can have little to say and feel like padded-out short stories, while novels themselves these days seem to be getting longer for no apparent reason, but this offering manages to pack into it more than most in terms of plot and characterisation; there’s even plenty of scope for a sequel and perhaps even an entire series. Before picking up the book, I was familiar with Ames only via his US mystery-comedy series Bored to Death, which ran for three seasons and was shown in the UK on Sky Atlantic. 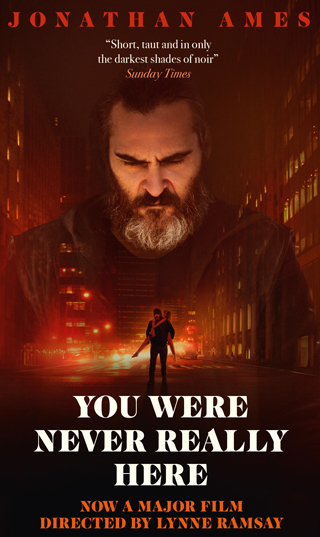 Wildly funny and hugely entertaining, it did not prepare me for You Were Never Really Here. Without prior knowledge, nobody would ever guess they were by the same person. In fact, the book seems to be far removed from much of Ames’s previous work, which mostly comprises of comedic writing and memoir; he produced a self-deprecating column for the New York Times for many years. You Were Never Really Here contains no laughs whatsoever. Instead, it’s the sort of tale Raymond Chandler or Dashiell Hammett would be writing if they were around in the 21st century. A film version written and directed by Lynne Ramsay and starring Joaquin Phoenix as Joe had its premiere at the Cannes Film Festival last year and received a seven-minute standing ovation. Ramsay won the Best Screenplay award, while Phoenix was named Best Actor. It premieres on Amazon Prime Video on March 9, and a quick bit of research suggests that the ending has been altered. Nevertheless, you may still feel the need to applaud Ames’s literary skill after turning the final page.